A tasty stir-fry for your Summer hit list. Steak and green bean stir-fry with ginger and garlic. 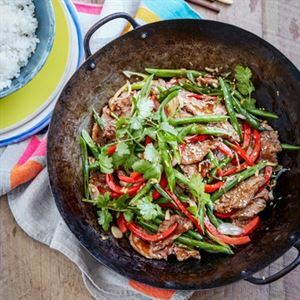 Fresh and flavourful – Curtis' easy stir-fry is perfect for Summer nights with friends. 500 g beef eye fillet or porterhouse steak, cut across grain into 5mm-thick slices. (If you're in a rush, pre-cut beef strips can also be used). In small bowl, mix 1/4 cup water, oyster sauce, rice wine, and soy sauce; set aside. Heat wok or large frying pan over high heat. Add 1 tablespoon canola oil and swirl to coat cooking surface. Add beef, spreading it out in single layer. Cook without stirring for 2 minutes, or until well browned on bottom. Transfer beef to shallow baking tray and set aside. Add the remaining tablespoon of canola oil to wok, then add capsicum and green beans and cook, stirring often, for 2 minutes, or until vegetables soften slightly. Stir in eschalots, garlic and ginger. Stir oyster sauce mixture add to wok and cook stirring often for 2 minutes, or until vegetables are crisp-tender and sauce has reduced slightly. If tuna loin is unavailable, use tuna steaks or any other firm-fleshed oily fish.